In our enthusiasm to get our books written and published, we often lose sight of the fact that there’s a lot more to self-publishing a book than writing the manuscript. In this article, Nina Amir tells us the reality of the work involved with self-publishing. Do you think you’re up for the challenge? While the idea of self-publishing often seems appealing—even exciting—to aspiring authors, they may not realize what becoming an indie publisher or author really means. And the job description actually may be one far removed from their dream of becoming a writer or author. An indie publisher or author is a writer who self-publishes their own books by creating an imprint, also known as a publishing company. Although there are many well-established traditional “independent publishing companies” that publish the work of authors, entrepreneurial-minded authors who strike out on their own, not relying on subsidy publishers (vanity presses) to publish their work, are known as “indies.” If you decide to do the same, you become responsible for purchasing ISBN numbers for your books and also managing all the production stages necessary to get your book to press. Here’s the rub: Most writers don’t want to be businesspeople. They want to be writers. In fact, most aspiring authors are a lot like me, and when the word “business” enters into a conversation they suffer from what journalist Ted Koppel called the MEGO factor (My Eyes Glaze Over). Yet, more and more often these very same writers become indie publishers and authors despite the fact that starting up a business is the farthest thing from their minds. They simply decide to self-publish a book and don’t realize that this act makes them entrepreneurs. Indie publishing success requires a huge amount of business savvy. Lacking that, it requires the willingness to learn the necessary skills to run a business or to assemble a team to help you run your new start up. Hire a professional book editor (or editors). Hire an expert to convert your manuscript to a mobi and/or epub file. Upload your files to the appropriate book distributors (and all that goes with that). Plan all promotion for your book. Notice that while some of these activities are distinctly publishing oriented, others are simply business oriented. The latter include tracking finances, analyzing sales and managing subcontractors. Let’s say you are not put off by the need for business savvy. You are willing to become an entrepreneur—or an authorpreneur—and create a start-up publishing businesses of your own. Or you’ve jumped into indie publishing and now have need to wrap your arms around entrepreneurship to keep your business afloat. What business necessities do you need to succeed? It’s extremely difficult to achieve success if you don’t know what it looks like for you or if you haven’t defined success for yourself. While the publishing industry defines success in terms of book sales, this might not be how you previously have defined success. As a publisher, sales must become part of your definition. If you want to publish a successful book, you need to know how many sales that will take. Must you sell 500, 1,000 or more copies per year? A “break-even analysis” will help you determine this, which entails knowing what it cost to produce your book. Beyond this, how much money do you want to make? What’s your vision of success as an author and publisher? Without such a vision, you may flounder around never knowing what steps to take to succeed. Be sure you have the funds to take your project to completion before you begin. Most companies have monthly, quarterly, semi-annual, and annual goals to meet. This helps them continuously move toward their vision of success—their long-term goal—by achieving small successes along the way. As the publisher, it’s up to you to create the goals for your company. These can be goals for when and how to publish your book, how many books to publish per year, how many books to sell per year, or how to promote each book. Your long term goals can also include how much money you plan to earn from your book. Be sure you create a sound promotion plan for your book. Although each book will have an individual promotion plan, consider creating an umbrella promotion plan for your company that you can apply to all your books. Tweak it for each book depending upon the market. Promotion helps sell books, so this is an important aspect of the book publishing business. To keep track of how your company fares financially, you need a profit and loss statement. This allows you to determine if your start up is getting out of the red and into the black. You need to know if your company is actually making money—or if you are losing it. Good businesspeople keep close tabs on income and expenditures. It’s important to build deadlines into your planning. This ensures you get your books published in a timely manner. It also helps you work with contractors. This why having both a timeline with deadlines built into it and a list of contractors and their deadlines are good additions to your list of business essentials. If you have additional resources upon which you rely, create this list and add it to your essentials as well. A good publisher always thinks beyond one book. In fact, you’ll sell more books if you write more books. And you’ll earn more money as an author if you brainstorm additional ways to build a business around your book, such as courses, coaching, teaching, or speaking. Consider how you can brand yourself—and make more money—with books, products and services. The most successful start-up companies are based on sound business plans. Additionally, every book should have its own business plan. Before setting out on your new entrepreneurial venture, create a business plan for your publishing company. Then create a business plan for every single book you plan to write. Each book is a new product and a new business center. No traditional publisher ever publishes a book without first determining its viability; this is done by studying the book’s business plan—the book proposal. The previous seven essential actually could—and should—go into your indie publishing company business plan. 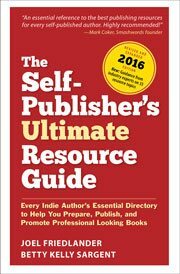 If you decide to become an indie publisher, also become a savvy new publishing entrepreneur. Take the time before you publish your first book to create a business plan for your book and for your company. This will help ensure that your start-up company thrives and enjoys a long life, which means you have successful career as an indie author. Photo credit: tribalicious via photopin cc Amazon links contain my affiliate code. I was on another site where a long thread debated the merits of using a Publisher’s name. A lot of people felt it was dishonest and misleading if this Publisher only existed for your own purpose of trying to look professional and in fact didn’t actually exist (you may have registered the name and all but your publisher as a real live entity that actually can be considered a small press doesn’t really exist). For example, using Kobo’s writing life you can upload your book and there is a field title PUBLISHER so I wonder if I can leave it blank, use my other name, or do I really need to create a publishing entity? Do I plan to write and publish more than 1 novel? Yes. One should be ready later this year and I have 2 others in various draft stages. But I don’t plan on publishing others’ work. Thanks for any advice (clarification) you can offer. Sorry for any English mistakes as English is not my first language. Thank you for your article. There is another element that could be taken into consideration. Creating/writing/self-publishing a book, is almost the same approach than creating/writing a script/producing a live show. It is better to be surrounded by professionals but it costs. So there is a way to finance all these costs. When we have a budget, then we can divide the final cost into a x number of investment units, and look for investors. Selling to an investor needs the same passion than to sell to a publisher. Of course, a real publicity budget has to be budgeted because investors need to understand how you are going to reach your public. of course it is easier with non-fiction books or conceptual book projects. Of course, that is true, and a great idea. And you can use crowd funding, such as indiegogo.com or pubslush.com. But this becomes part of your business plan. And you raise the capital in advance, and you have a plan for reimbursing your investors or for giving them something in return for their backing. I’m sorry…I don’t have the answers to those questions. Thanks for the article. I have some questions about establishing the exclusivity of a name for a publishing company that I am having a difficult time finding clear answers to. You could have 2 different people legally establish a different business entity in 2 different states that have the SAME business name. This happens all the time and if there are conflicts or confusion in the marketplace, they are sorted out through civil trademark litigation. My questions are not about establishing business entities, they are about how the publishing industry manages itself. Can you definitively establish exclusivity of a publisher name ahead of publishing a book? Does Bowker and the ISBN purchasing process manage the exclusivity of your publishing company name? If someone has purchased ISBNs under a particular publisher name, will Bowker prohibit the purchase of ISBNs from another publisher trying to use the same name? Obviously, there is time and money that goes into establishing a business entity, so it’s helpful to know if you can easily establish exclusivity of a publisher name. Thanks for your help. David, I’ve found Bowker to be very responsive to help requests. Here’s their support number: (877) 310-7333 Hope that helps, since they are the only ones who can answer your question. This is a great post, Nina. You’re absolutely right. We start off — or at least I did — with this drive to write books. But once we write them (and if we decide to self-publish) there are many aspects to publishing that we will have to coordinate. We not only have to hire editors, we have to find good editors. The same is true for finding cover designers. The vetting process itself is time-consuming. Once the book is published (Yay!) we have to market it and decide whether we can afford to pay someone for a blog tour or do it ourselves. Despite the costs — monetarily and our time — I think it’s worth it. It’s definitely worth it…we just need to know from the start that it’s a businesses. And like all start-ups, there are expenses and we must become savvy business people in addition to being writers. And I surely did most of it myself at first…and still do a lot of it myself now. Glad you found them useful, Greg. I joined RWA and a couple of other chapters a year ago and was surprised by how few authors could give me an answer on whether or not you need a business license and for those of us in Canada, a G.S.T number. Before beginning this career I owned and operated a restaurant for thirteen years and definitely needed these numbers for tax time so I’ve gone ahead and gotten mine. As well as a separate bank account and credit card. Any other recommendations you could share? Great advice to get all the important business licenses and numbers! I have business accounts (savings, checking and credit card) and I did register with the county as a DBA (doing business as) since I’m a sole proprietor. I’m looking forward to the year I make enough to incorporate (it’s expensive to do so), but this reduces your individual personal risk. You might consider a mail box at the post office. Great summation for all self-published authors and especially for those considering endeavouring. I learned all this through my own self-journey and there are many days I just want to write and not deal with the business aspect. But we have to learn these things to protect our own assets and the end goal for me is to become successful enough that I can hire some assistance down the road for marketing and finance so I can concentrate my efforts better on getting the next books out. I think we all start out “doing it all.” One of my coaching clients just asked me the other day who does the email newsletter and the posting to ezines and such. Me! Until recently…I only just have found it financially feasible to hire a VA. The day comes when you simply can’t do it all any more and write your books, too. But the road you travel to get to that point makes you a savvy business person. You learn the ropes. And that’s important. Good tips, thanks for posting! Excellent post, Nina! Every writer who wants to succeed should follow your advice. If you can be an entrepreneur as well as a writer, now is the best time ever to be a writer. It’s the same outstanding quality of information you shared at the San Francisco Writers Conference and will share at the San Francisco Writing for Change Conference on Saturday, September 6. Thanks so much, Michael! It is a great time to be an author, and there are so many options for how to become one. I actually find the authorpreneur part the most exciting. If authors can think about how to build businesses around their books, they can really become entrepreneurs. I agree, Michael. Nina has a way of making the best practices for authors seem logical and consistent, I love the way she communicates her clear vision of the entrepreneurial author, surely the future for one of the most exciting parts of the future of publishing. Excellent post. I created my own one-book publishing company H.H Bonnell, Publisher for my Novel “Saving Miss Oliver’s,” when my agent died while representing it to conventional publishers. Rather than start the agent search all over again I decided to be an Indie author/publisher and I did all the things you mention in your post. I found a great book designer, John Miller, who designed a cover that I think is better than most book covers from major publishing houses. And I also found an excellent copy editor and a fulfilment company Pathway Book Service, in New Hampshire that was linked to my website and also got books into stores through Ingram. It was a successful process BUT I spent almost a whole year doing it, plus lots of time marketing after it came out. I didn’t write a word during that time. Still, I might publish the sequel to Saving Miss Oliver’s which I am finishing now, if that turns out to be the best alternative. If I do so, I will do it via, H>H Bonell again because I am convinced I can get a better product doing it all myself. Sounds like you made a good choice. And professional editing and design makes a huge difference. It keeps your book up to the same standards as traditional publishing. As publisher, you must keep those standards. The other parts of running an indie publishing house should all be the same as well. Good luck with your second book. Nina is a true inspiration, and her shop could not be more lolevy. Her unique selection of merchandise makes it so special.And of course, the bonus is that she is such a dog lover too!